2012 Chevy Colorado with custom service bed / utility camper. Auto, 5cyl, Alarm/Keyless, MP3 CD, power windows and locks, with like new tires. 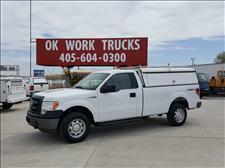 Visit OK Work Trucks online at www.okworktrucks.com to see more pictures of this vehicle or call us at 405-385-8888 today to schedule your test drive. Message: Thought you might be interested in this 2012 Chevrolet Colorado. Friendly service, no pressure and good products for all, a pleasurable experience.